I fled campus on Friday afternoon without going to the library for a DVD, because The Big Game is happening this weekend (our football team is playing that of a neighboring state school and ESPN is here) so I ended up watching part of Bellini’s I Capuleti e i Montecchi from the Bayerische Staatsoper in 2012. It’s a bootleg of a live broadcast, with Netrebko and Kasarova in the two main roles, and I discovered when watching it that rather than the entire opera, I have two copies of Act II. So, I watched Act II. Perhaps someday I will find Act I. But Act II is pretty good. 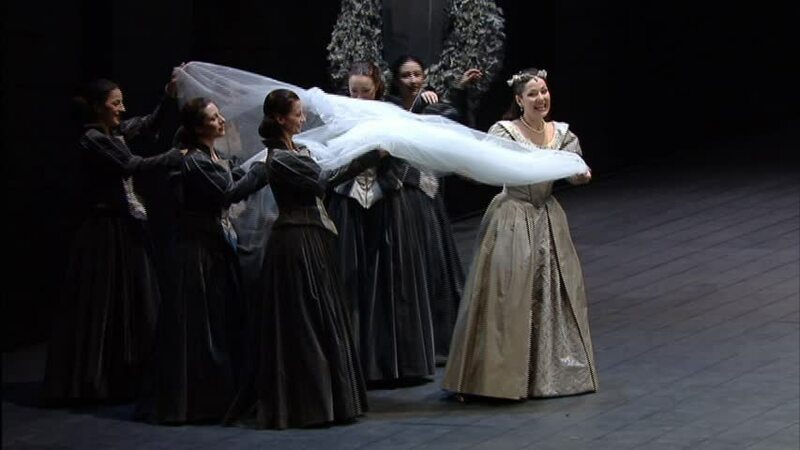 It begins with Juliet (Netrebko) wandering across the stage on what looks like the back of a half-pipe in a little poofy white dress, agonizing over the fate of Romeo; Lorenzo (here a doctor rather than a friar as in the play – was this a case of the Italian censors being squeamish?) arrives with the Death Roofie, which Juliet takes*, appears to die and is put in the tomb, and then Romeo shows up, etc. etc. we know how this goes. The staging is very simple, just a long set of stairs and a few other open spaces, with one large illuminated circle that evokes the moon for Romeo’s “Deserto è il loco.” At the end, the two characters, having killed themselves, are standing and wandering, dazed, forward as the lights darken. I am not always a super-fan of Anna Netrebko, but I really liked her here. And I always forget how convincing Kasarova is in these trouser roles. I don’t know how she does it, but as ever she’s proof, as if we needed more, that you don’t have to look “boyish” to nail these characters. So anyway. Murky darkness. In addition to the gloom, great big knives are a recurring motif, looming in place of pillars in the hall of the castle (there are little wreaths of flowers placed around the ends in celebration of the wedding). 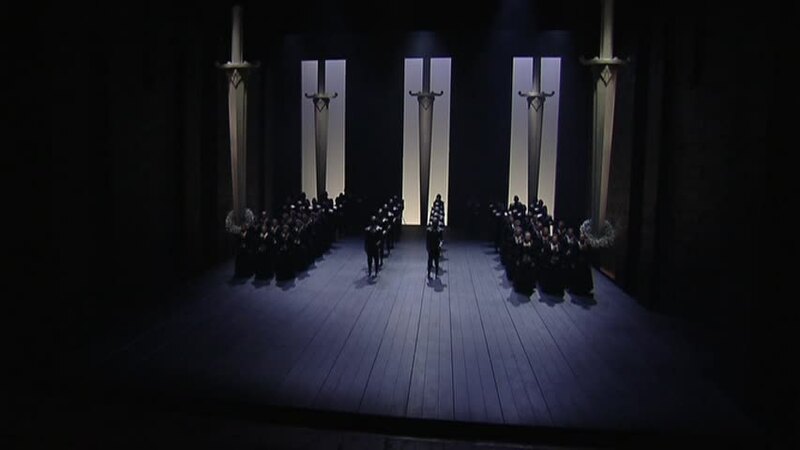 Some elements of the production, like the knives, and the rows of chorus members dressed in black and gunmetal gray and standing in grim ranks for the “A festa! a festa!” section in Act I, would not be out of place in a rendition of Don Carlos. This production, by Pier’ Alli, is literally quite dark. In Act II in particular the gloom never lifts – much of the action occurs in a sort of murky twilight. When Elvira, who has evidently not been trained to stop and ask questions when something unusual occurs – like one’s boyfriend suddenly vanishing – has gone mad and is wandering around making everyone feel bad, she carries a little spherical lamp the glow of which is too feeble to illuminate anything. Which of course is entirely logical, given that she’s nuts. I will say this in terms of drama. Most of the sopranos whose performances of this role I have enjoyed have done what Nino Machaizde does here, which is imply in that very first scene with Giorgio that Elvira is not the most stable or even-keeled young person in the world. Actually, now that I think about it, this may be one of those places where the music is better than I think it is – this impression is not the creation of good acting alone. I had never heard Machiazde before; I am beginning to suspect that there is a long list of singers who do a lot of 19th-century Italian opera, often in Italy, that I never hear about because it’s normally not the kind of thing I go looking for. And it doesn’t get broadcast or recorded with the same degree of regularity and ease of access as things from New York or the Bavarian State Opera or whatever. But anyway. Machiazde’s voice loses a little bit of shine on those very loud top notes that Elvira has to belt out occasionally – but it’s only a little shine that gets lost, and the rest of it has that solid, creamy sort of sound that is pretty hard to object to. And apparently I am inadvertently on a Juan Diego Florez bender. Or possibly whoever it is that buys DVDs for the library is on a Juan Diego Florez bender. Either way, here he is again as Arturo Talbo. I may have said this before, but there is something funny about the Italianization of Talbot to Talbo. I am not sure why it is funny, but it is. It happens in Donizetti’s Maria Stuarda too. ‘Talbo’ strikes me as somewhere between a good name for a puppy and a character in a Rudyard Kipling story. But anyway. Arturo Talbo, a young Englishman who has mislaid several of his consonants decided to place love above political loyalty, sort of, is sung by Juan Diego Florez who is probably exactly the sort of tenor you want for this. As I mentioned in the context of the Donizetti opera last week, this is his element. He knows the style, he can reach all those tortuous high notes, and he looks the part. This is not specific to him, really, but on the subject of style, I did notice that at one point he rendered “regina” as “re – ina”. I remember hearing Joan Sutherland do this too when singing Alcina, and at the time I figured that since people say she had terrible diction, maybe that was an example of it. As far as I know, “regina” is the standard Italian word for queen. Does skipping the ‘g’ make the vowels easier to sing under some circumstances? Or is this just a weird coincidence? The DVD of this performance is listed as 2011, but internal evidence suggests it was a few years before that – and indeed, the closing credits say 2007. I just finished watching this DVD of opera recitals from the Met in the early 1980s. The clip below is the point at which the Troyanos/Domingo part of the recital got going for me, at least. In the track listing for the DVD it is noted as simply “Duet, Act I” from Bellini’s Norma and I think the idea is that you’re supposed to know what that is already and what all the words mean, because there aren’t any subtitles. There are pleasures that are not guilty. Running, for example. Sleep. Being able to say ‘I told you so’ but not saying it, especially if the other person knows you’re thinking it. Musically, there are pleasures that are not guilty: I do not feel I have to be embarrassed if I’ve listened to, say, the Amadeus Quartet playing Haydn’s Op. 76 string quartets over and over. But some things I am less eager to admit listening to. At least, not without prefacing the admission with an indication that I know it’s silly, and that I am listening to it in part for precisely that reason.